The Daily Randi: No Whining, Only Wine-ing! Well, I Moved!! Yay, Me! It actually was A Pretty Simple Move. Oh, sure, we don’t have A Working Phone yet. Nor do we have A DSL Connection. Yesterday, our Sink and Dishwasher Overflowed. But, at least we have A Dishwasher now! And we have Cable so I can catch up on all My Tivod Episodes of America’s Next Top Model! So, who really cares if and The Water Won’t Drain From The Bottom and it Overflows?! I am Loading That Baby Up anyhow and Curling Up in front of A Television Set! I will just Pretend The Dishwasher Works. Later, when Totally Awesome Boyfriend isn’t looking, I shall Sneak In and Wash The Dishes By Hand, then Reload them into The Dishwasher and label them, “Clean!” By the way, before it Broke, I had already done Ten Loads Of Dishes. God Bless Timesaving Kitchen Appliances. And God Bless Tyra Banks. 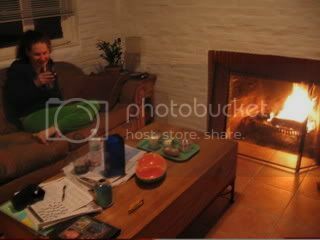 I leave you now with A Photo Of Me, Relaxing By The Fire with A Glass Of Wine and A New York Times Crossword. Yes, according to Totally Awesome Boyfriend, 70 Degrees is Cold Enough For A Fire. He told me if I have A Problem With It, I should just pretend I am Camping because it is Always Okay To Light A Fire When You Are Camping, even if it is Summer and even though we have pretty much Unpacked, we have yet to Hang Things On The Wall, which is A Very Camping-Like Thing to do. So, A Fire, we have Enjoyed. And now, if you will excuse me, I must go back to Pretending to Dishwash My Dishes! And America’s Next Top Model, natch. Congrats on the new apartment and the new beginning with TAB! :) Enjoy!! You DO look cozy! I am so jealous of your fireplace, your dishwasher, and your pretty brick walls! It looks like you have it made - congratulations! Congratulations on the new place. You look wonderfully cozy. So, when is the blogosphere housewarming party for you two? Very exciting! And I agree, that looks cozy! I miss my fireplace. Congrats on the move. You deserve a little relax-by-the-fire-time!